The kiwi is the top performer today while the yen lags. This is the classic pair for the risk trade, although I'd argue that's a dangerous way to look at it given the housing fears in New Zealand and flat interest rate profile for the foreseeable future. What's interesting is how well it's held up in the turmoil this month. I wrote about it earlier this week and it's continued to pan out. The pair formed a triple bottom ahead of 72.25 and has been climbing since. It's now at the highest since October 4, when the S&P 500 was just off its record highs. What's interesting is that this pair led the risk rout by a couple days, falling in five straight days from Oct 2 to Oct 8. 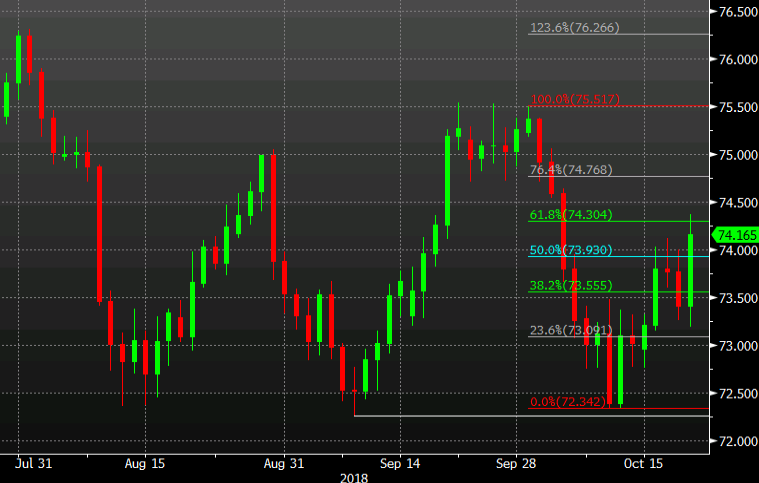 Technically, the pair ticked above the 61.8% retracement of the October decline earlier today but has slightly pared its gains and fallen back below.